Hi everyone ! 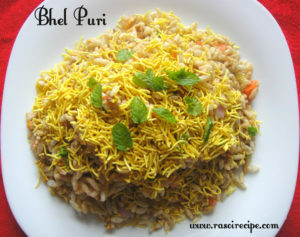 Today’s recipe is ‘ Bhel Puri’. Bhel puri is also a form of chaat, it is made of puffed rice, papdi, spicy and tangy chutneys, namkeen/nylon sev (noodles shaped fried snack made out of gram flour) and vegetables. It is very closely associated with Mumbai and its beaches. 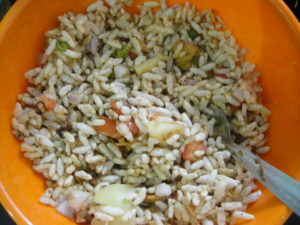 Some other variants of bhel puri are jhaal muri (Kolkata) and churmuri (Bangalore). Bhel puri is my favourite snack. I can have this yummy snack at any time of the day, yes I sometimes feel like having it early in the morning as my breakfast. 😀 😛 In this recipe instead of using green chutney I used that same paste which I used for preparing pani puri spicy water. For more chaat recipes you can check Pani Puri (Gol Gappa or Puchkas, homemade pani) , Dilli Style Aloo Chaat , Macaroni Chaat (Pasta/macaroni in yogurt) , Mixed Fruit Chaat (bowl full of flavours . 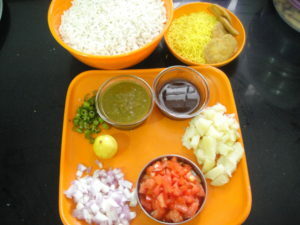 All the main ingredients of bhel puri. Combine all the dry ingredients and vegetables in a big bowl. Last step is to add both the chutneys and papdi. Mix everything nicely, till all the ingredients are mixed uniformly. 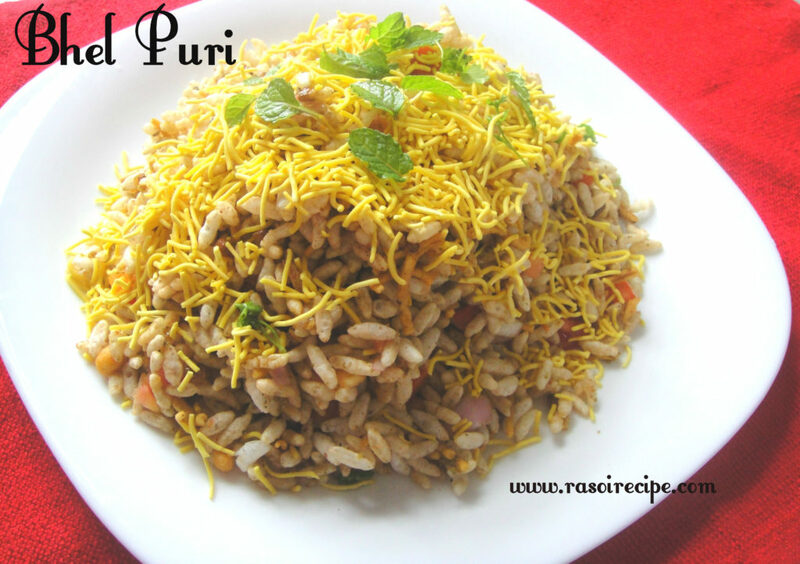 Garnish bhel with sev and mint leaves, serve it immediately. For dry bhel or sukhi bhel, all you need to do is skip both the chutney. For jain bhel skip onion. Add raw mango instead. Nylon sev is a very thin variety of sev. Always use nylon sev for chaat and bhel. I agree with you Shwetali. 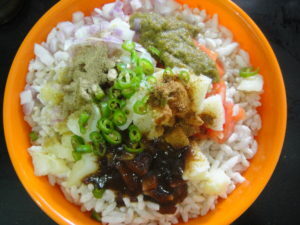 I love bengali food. 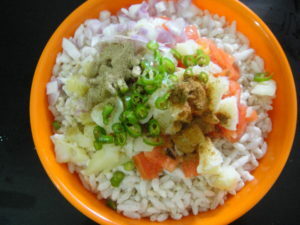 I love the simplicity and flavours of bengali cuisine. Alisha bhel puri is my all time fav snack.I too can have it at any time of the day.It is just too good.You always increase my cravings for all these delicious recipes.I am feeling hungry…. I’ve never seen this dish before. It sounds interesting and looks delish! And quick to whip up too! 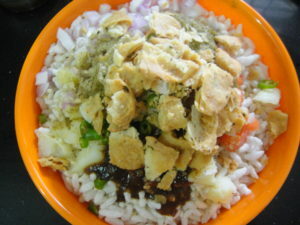 It is a very popular street food of Mumbai.